NUTRILITE Fibre Powder is a special blend of three soluble fibres from naturally derived plant sources, offering a convenient way to get additional fibre. This taste-free, easy-to-mix dry powder can be sprinkled onto foods or mixed into liquids. 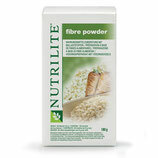 The recommended daily intake of fibre for an adult is 25–30 g. This product contains 5 g soluble fibre and can be taken in conjunction with other NUTRILITE fibre products, to provide you with different sources of fibre. NUTRILITE Chewable Fibre Blend tablets contain dietary fibre from 13 different raw materials such as fructooligosaccharides and fibre from acacia, sugarcane, oats, acerola cherries, wheat, lemons, soy, cactus pears, apples, peas, barley and carrots. This special blend of naturally derived fibre, with orange cream flavour, makes it easier to enjoy the health benefits of a diet rich in fibre. It is recommended to consume at least 25–30 g of fibre daily. Our special blend contains soluble and insoluble fibre, making it important to include both in your diet. bodykey by NUTRILITE Meal Replacement Bars are a delicious, healthy way to get to your optimal you and your optimal weight. Contribute to weight loss and maintenance, but also great for healthy lifestyle seekers. Provide a nutritionally balanced replacement for regular meals, thanks to vitamins, minerals, fibre and protein. Convenient to enjoy ‘on the go’ and wherever you happen to be at meal time, thanks to handy, snack-size portions. Compatible with any bodykey by NUTRILITE diet type, which means it easily fits into any daily routine – no matter how hectic or demanding. Treat your taste buds with delicious Dark Chocolate flavour and enjoy every bite of your weight-loss and healthy lifestyle journey. 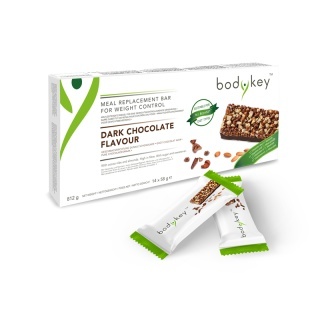 To support your personalised weight-loss programme, the bodykey chocolate shake will give you the help you need. This meal provides you with a balanced profile of macronutrients, in an instant and delicious way! 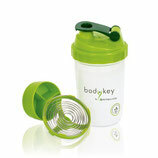 Mix the contents with 250ml of semi skimmed milk in your bodykey shaker and get ready to lose weight easily! 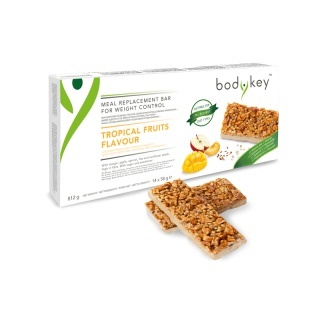 To support your personalised weight-loss programme, the bodykey vanilla shake will give you the help you need. This meal provides you with a balanced profile of macronutrients, in an instant and delicious way! Mix the contents with 250ml of semi skimmed milk in your bodykey shaker and get ready to lose weight easily! A convenient and practical shaker consisting of four compartments: The main compartment for cold liquids, allows you to create drinks and shakes. Thanks to the advanced spiral design, you can create perfectly blended smoothies. The second compartment is specially designed for keeping vitamin and mineral supplements in either tablet or capsule form. This compartment is divided into three parts and allows for the convenient storage of three different types of supplements. The third and fourth compartments are designed for powdered products such as shakes and powdered supplements. To give you extra support on your weight management programme, the Natural fat reducer provides the help you need. This product, based on a 100% natural fibre extract from the opuntia cactus, minimises nutritional fat absorption, blocking up to 27% of fat in a meal. Try to combine it with a reduced calorie diet and appropriate physical activity and then you will be ready to manage your weight! To give you extra support on your weight management journey, the Natural carb reducer provides the help you need. This product, based on a 100% natural fibre extract from white kidney beans, blocks up to two thirds of the carbohydrates in a standard 600 calorie meal. Try to combine it with a reduced calorie diet and appropriate physical activity and you will be ready to manage your weight!